Mcjarv wrote: I think I had now 37 and now 42 too on cd. I think I had one on cassette too but i cant remember what it was...32 maybe? no idea. aw when did they stop doing them? or can you still get them? AS TwoHeadedBoy pointed out they are still going(I think I even mentioned that in my first post) and have kept up with the modern age by being available on MP3 (legal) downloads. I was thinking of buying the latest one, just to see what it is like. I'm afraid that I'm not in step with modern music much. saw Now 12 fatbox CD in a charity shop today, brought back some memories...thought for £3.99 it was worth it. That was my first one, too. It had an orange-coloured backdrop, if I remember correctly. 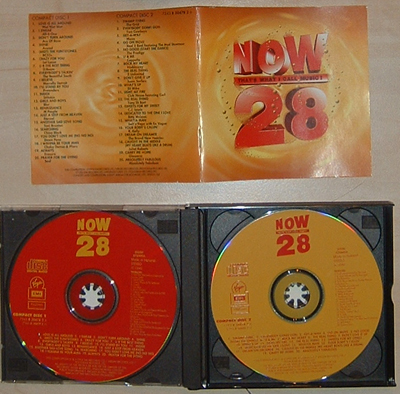 Got Now 29 after that (think it was blue with ice or snow in the design), then Now 32, and then I realised that instead of buying Now albums for the one or two songs I wanted, it would be much better just do buy the respective bands' albums instead. I had the first twelve on vinyl. Now 7 was the one that had a bonus track on side three (a total of nine tracks on that side!) making it the biggest one of the vinyl era. The bonus track was "A Kind Of Magic" by Queen if I recall. The first eight or nine had plenty of decent tracks, but melody was forced out to an extent sometime in 87/88 and things went downhill after that. Those early days of NOW bring back the good times though for sure. The only one I've ever owned was Now 23, late '92 (I was only 10!). I can proudly boast to never having owned any of them - though a sad older brother bought them with great regularity, afraid I was too busy listening to Maiden, Metallica, Rush and lots of other bands who continue to selling great quantities of tickets and albums to this day. I dont know if there is a hidden lesson here - but I dont remember hearing much from Jive Bunny, Howard Jones, M.C Hammer and the likes recently. PanzerGeneral wrote: I can proudly boast to never having owned any of them - though a sad older brother bought them with great regularity, afraid I was too busy listening to Maiden, Metallica, Rush and lots of other bands who continue to selling great quantities of tickets and albums to this day. I dont know if there is a hidden lesson here - but I dont remember hearing much from Jive Bunny, Howard Jones, M.C Hammer and the likes recently. So glad to hear of your superior tastes in music. Unfortunately, the point you make is fatally undercut by the track listing of Now That's What I Call Music 12, which proudly includes "Can I Play With Madness"...by Iron Maiden! ive just found this thread ! 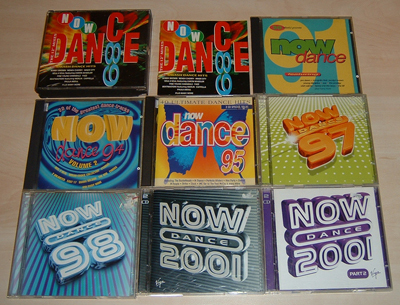 If anyone wants them, they are welcome to them..
Ooh, Now Dance 97! Had that on tape as well - soundtrack to Xmas 1997, that one was. 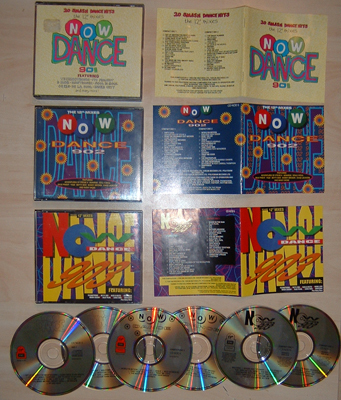 I've not bought a 'Now' compilation in years, the last time was probably about 8 years ago. I do remember buying some in the early 90's. It didn't get really into music untill I was about 12-13. The first Now I do remember was Now 17, it was a vinyl and I remember trying to get to individual tracks by moving the stylus.